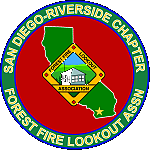 Forest Fire Lookout Associations San Diego Riverside Chapter (FFLA_SDRC) Introductory Video. There was a time in the past century when lookout towers sat atop mountains and hills all over Southern California, manned by professionals from the U.S. Forest Service who scanned the horizon searching for the slightest puff of smoke. Across San Diego County — from Cuyamaca Peak to Mount Woodson to Black Mountain and beyond — the towers offered the best way to detect wildfires quickly. Most of the structures have long been abandoned, replaced by back-country cameras, satellite technology and better communications systems. 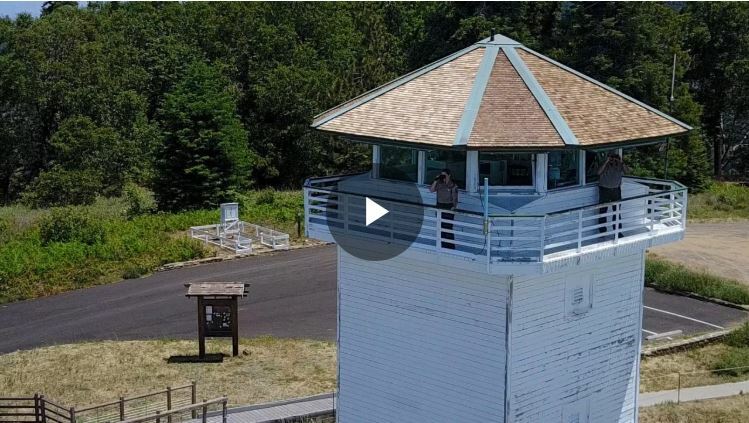 Today there are just three lookout towers in the county, including two on Palomar Mountain that have recently been brought back to life by dedicated volunteers in partnership with the federal and state government. For the spotters, the work is both peaceful and challenging. Cuthbert was one of three volunteers staffing the Boucher Hill Lookout on Palomar Mountain Tuesday. The Boucher site is the most recent tower to be brought back into service and has quickly become what experts believe is the most visited lookout tower in the United States. Located in Palomar Mountain State Park and owned by the park system, the Boucher Hill Lookout is staffed every day from May 1 to Thanksgiving by at least one of 90 volunteers. The lookouts work full days, stretching roughly from 8 a.m. to 6 p.m. This past month, eight fires were reported first by lookouts at the Palomar sites, said Neil Cadwallader, the assistant chairman of the local lookout association. The other tower, High Point, reopened in 2009 roughly five miles from Boucher, on a remote piece of Cal Tech property on the northern side of the mountain. Boucher is much easier to access, with paved roads just past the entrance to the state park. Boucher is also is a historical site that, according to Lookout Association website, has held some kind of lookout tower since 1921. The current structure was built in 1948 and was in service until 1983, before being shuttered for roughly nearly three decades. The California Parks Department spent about $350,000 refurbishing the tower, which reopened in 2012. Visitors can now climb the 43 stairs to the top where they will be given a lesson on the tower’s past. The first year it reopened, the Boucher tower recorded 1,438 visitors. Each year the number has increased, and in 2016 more than 11,000 people dropped by. Some of them have since become lookout volunteers themselves. “We don’t know for sure because there aren’t any statistics, but I like to claim that … this is the most visited lookout in the world,” said Cadwallader. He said the next busiest tower doesn’t get half as many visitors. Over at High Point, Scott McClintock — chairman of the local lookout chapter and a retired San Diego Sheriff’s Department commander — was staffing the tower Tuesday. The High Point tower takes 94 steep steps to ascend. “We don’t get many visitors here,” McClintock said. The tower is run in partnership with the U.S. Forest Service, so volunteers there wear a different uniform than when they work at Boucher Hill, which is controlled by the state. Most volunteers serve just once or twice a month through the lookout season. About 75 percent of them are retired and many have previously worked for the forest service. Most have always loved the forest and outdoors. Nathan and Jenna Pyle don’t quite fit that mold. The younger couple have full time jobs — like Cuthbert, they also work at the Zoo — but both volunteer once or twice a month at the towers. The Pyles and the other volunteers also get a kick out of the attention to detail that was paid when the towers were refurbished. Each tower looks like it did from years ago. Boucher Hill has been retrofitted to look exactly like it did when the tower was rebuilt in 1948. “We even used the same ugly green paint,” Cadwallader said. Sixty miles to the south is the county’s third tower, Los Pinos, which has been in continuous operation since the 1930s and is owned and run completely by the fire service. Curt Waite is a full-time employee who spends four days a week and three nights inside the lookout near the US/Mexico border near Lake Morena and the Corral Canyon State Off-Highway Vehicle Park. Waite was at one time the volunteer association’s chairman. Los Pinos was formerly the domain of Norm Mitchell, who held the main lookout job for 27 years until his death earlier this year. Waite was offered the position after Mitchell passed away. He said he doesn’t get lonely, even though the tower is deep in a wilderness area and visitors are far and few between. A former missionary who operated Christian radio stations in the Caribbean, Waite said he was drawn to the lookout association after reading a story about High Point coming back on line. Los Pinos is the only tower to have never closed, partly because of its proximity to Mexico, where people crossing the border have been known for decades to accidentally start blazes, and because of its closeness to the off-road area and popular hiking trails.